Guide in 'Crafting & Gathering' published by Caimie Tsukino, Apr 4, 2015. This "Part 2" guide contains information that is OUTDATED, and no longer applied in Heavensward. The REAL FUN of crafting only just begins after you have acquired all level 50s, and obtaining the title "Builder of the Realm". Unlike a DoW/DoM job, which has only a few cross class skills, any level 50 crafting class is allowed to have like 10 cross class skills. Why? Because that’s what high level crafting is all about! It’s all about how you come up with a way to mix & match these skills to HQ that crafted item! This is why the real fun begins only after you have acquired ALL the different Cross Class Skills. You now have all the "tools" you need for your crafting career! This may be a difficult task for a fresh lvl 50, or even for a fresh "Builder of the Realm" who does not have the proper gear yet. It's a chicken/egg problem. You need crafting power to craft your own gear so that you have the crafting power. (1) I recommend buying the Militia Offhand from the Market Board (or asking someone to make it for you). The offhand will provide a lot of extra craftsmanship & control, which will help a lot in the making of 1 star items. (2) A level 50 WVR will also help a lot here, since a strong WVR can craft a good number of end-game crafting gear. Your end-game crafting gear are only 1 star 80 durab items (like Weaver's Gibus, Weaver's Gloves, Weaver's Swallowtail etc. ), and they're relatively easy comparing to the 1 star 40 durab items (Twinthread, Darksteel Nugget, Hippogryph Leather etc.). Try to gather as much HQ mats as you can and then make your own HQ gear. Even though you may not be able to HQ the Twinthread, you may still be able to HQ your end-game crafting gear. Once you have produced enough gear, your crafting power will be increased much, and you may be able to HQ the 1 star 40 durab mats. And with HQ 1 star 40 durab mats, it'll be a lot easier to HQ the remaining of your end-game gear. To acquire HQ 1 star 40 durab mats (like HQ Twinthread, HQ Rose Gold Nugget etc). You may choose to directly buy these HQ mats from market board (MB), or you can try to make your own. To make them yourself, it helps to have HQ raw mats (i.e. HQ Crawler Cocoon, HQ Gold Ore etc). Again, to obtain HQ raw mats, you may choose to buy from MB, or you can gather them yourself. To gather HQ raw mats, it requires a geared-up level 50 Miner/Botanist (please visit Caimie's Unspoiled Gathering Guide: http://ffxivrealm.com/guides/ff14-unspoiled-gathering-guide-by-caimie-tsukino.53/). Sadly, it runs into a chicken/egg problem again as you need crafting powers to make end-game gathering gear. It is very hard for a fresh level 50 MIN/BTN who does not possess end-game gathering gear to gather Unspoiled Mats. There's no real solution to this. If you have enough cash to buy some HQ raw mats, you may do so and try to make your own gear. Otherwise, it might be easier to send mats to an established crafter so that she/he can help you out a bit. Once your gathering classes are geared up, and you have better access to free raw mats, then you can afford to practice on making HQ Twinthread, HQ Rose Gold Nugget etc. With a better supply of these mats, you should have no problem making all your end-game gear for every class. Visit Ch27 for hints on crafting rotations for all these items. If you have the Ehcatl Smithing Gloves, you may choose to use this instead of the class-specific gloves. It saves you the trouble of overmelds. The Ehcatl Smithing Gloves can be shared by all classes. It provides 3 more control than fully melded class-specific gloves, but 3 fewer CP. When you are getting close to end-game crafting, it is inevitable that you will need to meld materias onto your final HQ crafting gear. What is "Overmeld (or Forbidden Meld)"? Overmeld is to meld more materia onto a gear than the number of materia slots that the gear has. In this game, most clothing have only 2 materia slots, accessories have 1 slot, vintage items have 3 slots, and head/chest combined or pants/boots combined armors have 4 slots. However, ANY item that has at least 1 slot actually allows a maximum of 5 materia to be melded on it. Melding of materia into slots is an action that is 100% guaranteed success, while any more melds beyond that are "overmelds", and the chance of success is dramatically reduced. When an overmeld fails, the gear remains intact, but the materia is destroyed. Overmeld is the worst thing for a crafter. It practically drains all that hard-work money you gain each day within a few minutes. However, despite being expensive as hell, it is very important that you try your best to max out the stats cap when you overmeld a piece of crafting gear. In the past, we had to overmeld the i55 Class-Specific AF Gear (AF Gear = Artifact Gear, a.k.a. standard end game gear) of all 8 classes, each has 6 pieces of class-specific gear. It was insane, and it put us all into bankruptcy. Fortunate for you new crafters, S-E has now given out a lot of help to avoid the need of doing so. Your i55 AF hat will later be substituted by the "Artisan's Spectacles (i70)" (see the "Artisan Crafting Tools/Spectacles" chapter below), so it's fine not to meld it to max. If you have Ehcatl Smithing Gloves, you may skip the meldings of i55 class-specific gloves, and just use the Ixali ones. The Ehcatl gloves provide 3 more control & 3 fewer CP than the fully-melded i55 class-specific gloves. But its advantage is that it can be shared among all classes, saving the trouble of melding 8 pairs of gloves. The old i55 Militia offhand is designed that you cannot max out all the stats, so it becomes a signature item that makes a crafter UNIQUE. You can be high in control or in craftsmanship. You can also add up to 3 extra CP on the offhand if you want (see "The Offhand" chapter below). However, i55 Militia offhand will eventually be replaced by the new i70 Artisan's Offhand. So avoid overspending on overmelding this old offhand. Use only Tier III materia or lower on the Militia. (2) craft out the required HQ 2.5 star turn-in items so that you can acquire the Artisan's Specs (shared, i70), the new "Shared, Unmeldable i70 Artisan's Gear" (Artisan's Gown, Chausses, Artisan's Pattens... a.k.a. "shui70") & Artisan's Mainhand Tools (not shared, i70). With the above shared gear, you can then escape from the need of overmelding other classes. In Patch 2.5, the "Shared, Unmeldable i70 Artisan's Gear" (shui70) (Artisan's Gown/ Fingerstalls/ Chausses/ Pattens) were introduced to help crafters avoid the need of melding 8 classes. These new i70 gear are not crafted, but are obtained from Talan at Rev Toll by turning in HQ 2.5 star items, like HQ Silver Brocade. Although these are i70 gear, they are actually weaker than the fully-melded i55 gear by a very slight bit. However, it is a very nice addition to the game because: (i) shui70 is cheap! - acquisition cost is low because you just need to make those turn-in items, and the shui70 require no materia melds; (ii) once acquired, it can be shared by all classes, saving the trouble to overmeld 8 classes' i55 gear. With these gear, the Artisan's Mainhand Tools & Artisan's Specs, one can already proceed to 3 star crafting as long as they have some slight melds on their Militia Offhands. Since Patch 2.4, "Shared, Meldable i60 Artisan's Gear" (shmi60) (Artisan's Mitts/Culottes/Sandals) have been added to the game (see Ch25). In Patch 2.5, they even added the Artisan's Apron (shared, meldable i60). After melding materia to reach their cap, these shmi60 are currently the BiS (Best-in-Slot) crafting gear that can be shared by all classes, and will replace the i55 class-specific chest/gloves/pants/boots or the shui70. However, the shmi60 are 4 star recipes (see Ch24) that require 3 Ehcatl Sealants (see Ch25, 26) & 1 Mastercraft Demimateria (see Ch21). So it is impossible for a fresh Builder of the Realm to acquire them, unless he/she seeks help from the best crafters on their server. Ehcatl Sealants & Mastercraft Demimateria are very difficult to acquire (see Ch21 Desynthesis & Ch26 Ehcatl Sealant). Furthermore, each fully-melded Artisan's Mitts/Culottes/Sandals only provide 3 extra control over a fully-melded original class-specific i55 gear, thus they're only a slight step up. The Artisan's Apron, however, does provide significantly higher stats than the i55 class-specific chest. Since Patch 2.4, new Artisan's Offhands (i70) have also been added to the game. In contrast to the Artisan's Mitts/Culottes/Sandals, these new offhands are much more powerful than the old Militia offhands (+32 craftsmanship, +17 control). However, they're 3 star recipes that require 6 Ehcatl Sealants to make. So again, you will need to provide the mats to a strong 3 star crafter to do it for you. These offhands are class-specific, so you will have to meld 8 times for all 8 classes. The old Militia Spinning Wheel (HQ) provides 107 craftsmanship & 61 control. The new Artisan's Spinning Wheel (HQ) in Patched 2.4 provides 139 craftsmanship & 78 control. Thus, 32 extra craftsmanship & 17 control... a gigantic leap of power! Since Patch 2.3, new crafting belt, choker and earrings have been introduced in desynthesis recipes of GSM & LTW (see Ch21 Desynthesis). As you can see from the above table, the stats cap for those items differ from the old accessories. The old Raptorskin Merchant's Purse (HQ) does not provide any CP, but can add up to 3 CP from melds. The new Dodore Belt (HQ), similarly, can add up to 3 CP from melds. The old Electrum Choker (HQ) comes with 30 CP, with 6 additional CP from melds. The new Rose Gold Choker (HQ) comes with 32 CP, with the same 6 additional CP from melds. The old Red Coral Earrings (HQ) comes with 28 CP, with 5 additional CP from melds. The new Mosshorn Earrings (HQ) comes with 32 CP, with 6 additional CP from melds. In conclusion, these new accessories offer an extra 7 CP comparing with the old ones. Thus, before Patch 2.3, the maximum achievable CP value was 348 (or 391 after using Bouillabaisse HQ). After Patch 2.3, the maximum achievable CP value is 355 (or 398 after using Bouillabaisse HQ). As mentioned before, each of your crafting gear can add up to 5 materia in total. i55 Class-Specific AF Hat, Chest, Gloves, Pants & Boots (LEFT gear) each has 2 slots for materia that allows melds with 100% success rate. On the 3rd meld, 4th meld & 5th meld, each meld will have your success rate reduced by a lot in a non-linear regression (shown in diagram below). You can imagine you may need about 15 to 20 materia to get the last meld successful. For accessories (RIGHT gear) and the belt, they have only 1 slot, so it's even harder to overmeld. Technically speaking, tier of materia actually have a slight effect on melding success rate (comparison of the lines in the graph below). However, the difference is as small as 1 to 6%. If you're melding a Tier IV materia on your 1st overmeld, success rate is 29%. If it is a Tier III, it's 35%. If it's a Tier II, 41%. If it's a Tier I, 45%. However, a difference of 4 - 6% in S-E's retarded RNG is almost meaningless. It feels like whatever % you get, you'll still fail a lot anyway. Overmeld Rule 1 - Most expensive always goes first - ALWAYS meld the most expensive materia first. Therefore, PLAN all your melds ahead, and determine the sequence of melds according to the prices you see on the Market Board. Overmeld Rule 2 - Higher tier usually goes first - Materia of higher tier usually goes first because you don’t want to end up melding higher tier material in some late melds, which have a slightly lower success rate than lower tier on the same position. However, Rule #1 > Rule #2. If the lower tier is more expensive, meld the lower tier first. Overmeld Rule 3 - Avoid using/overusing Tier IV when you can use Tier III or/and Tier II - It is silly to use Competence IV or Command IV when you can get away with 2 lower tier materia of the same type. A Command IV is nearly 20x the price of a Command III + Command I on my server. It’s a lot cheaper to overmeld with the latter method. Spending 20x more may be affordable if you’re only doing this once, but you will soon see that you need to do this many times. You’d be spending 20 million instead of just 1 million. But again, this estimation is based on my server’s materia prices. You should check your market board. Since Patch 2.4, Artisan's Offhands (i70) have been added to game. However, the cost of these offhands are extremely high due to the requirement of 6 Ehcatl Sealants and because it is a difficult 3 star item. I suggest you stick with the old i55 Militia Offhands first, and have them "partially melded" with Tier III materia or lower only if you plan to transition into the new offhands later. Save all the Tier IV materia for the Artisan's Offhands. Keep doing Ixali Beast Quests to acquire Ehcatl Sealants, until you become a prominent 3 star crafter to take on the task of making your own Artisan's Offhands. Alternatively, once you have collected all the mats, seek help from a very strong 3 star crafter to get you the new Artisan Offhands before you start overmelding with the Tier IV materia. Below are offhand builds that suit the old Militia Offhands - as a mean of TRANSITION before you are able to acquire the Artisan's Offhands. After acquisition of the "Supra Tool", people can have craftsmanship above 415 if they have at least 11 craftsmanship melded on their Militia Offhands. In 3 star crafting, this high craftsmanship results in 75 progress per Careful Syn II under Ingen II, which in turn allows the substitution of a "Piece by Piece" by a Careful Syn II under Ingen II. Normally, it takes 2x PBP + 3x CS II under Ingen II to complete a 3 star item. With 415 craftsmanship, you may use just 1x PBP + 4x CS II under Ingen II. Thus, increasing fidelity, and freeing 15 CP. Together with the extra CP from the new accessories, it's sufficient to use an extra Basic Touch. Thus, for a high craftsmanship offhand build (11+ craftsmanship), although your touches will be weaker, you will have very high flexibility on ways to craft things. - Some of the strongest High Craftsmanship Builds on Militia Offhands that reach 11+ craftsmanship. However, there's no need to make Militia Offhands this strong now because of the new Artisan's Offhands that will eventually replace them. Although it sounds ridiculous, but I have found a good use for 2 extra CP squeezed out from the offhand in 3 star crafting back in Patch 2.2. It allowed me to substitute one Hasty T with a Basic T when the condition allows. And that just means a lot more fidelity for the final Byregot. However, since Patch 2.3, the new accessories (Rose Gold Choker & Mosshorn Earrings) offer 7 extra CP. With this change, the 2 or 3 extra CP from offhand no longer give as much an edge. At this point, it seems wiser to add more craftsmanship or control instead. - Caimie's favorite offhand build for 3 star crafting back in Patch 2.2 - the "High Control + Extra CP" build. However, the function of the extra CP has diminished in Patch 2.3 due to the extra CP that came from the new Rose Gold Choker & Mosshorn Earrings. (1) 5 craftsmanship = enough for most basic items & 3 star items. (3) 11 craftsmanship = enough for a better rotation for 3 star crafting if Supra Tool is acquired (hitting 415 total craftsmanship). (1) Before acquisition of Rose Gold Choker & Mosshorn Earrings, 2 extra CP from offhand is beneficial to 3 star crafting. (2) After total CP has gone over 347 (390 after eating Bouillabaisse HQ), extra CP from offhand is not that beneficial. - As many as you can get! Most of us currently leave the last spot open in case we need certain stats in future patches. 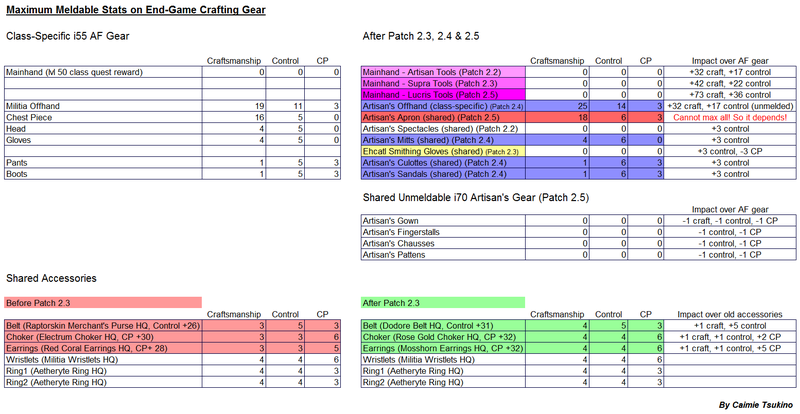 Before Patch 2.5 which the Artisan's Apron was added, the melding of 15 craftsmanship on the Artisan's Offhand results in a total of 451 craftsmanship, just enough to fulfill the minimum requirement for 4 star crafting. The melding of 17 craftsmanship results in a total of 453 craftsmanship, allowing the use of alternative rotations for 4 star crafting & i95 Primal Weapon crafting (see Ch27). After Patch 2.5, 453 craftsmanship can be achieved with the help of the Artisan's Apron, as well as with the help of the new Lucis Crafting Tools. Thus, you don't have to meld as much as 17 craftsmanship on the Artisan's Offhand anymore to access those alternative rotations. However, I would still recommend melding at least 15 craftsmanship on the offhand, as S-E probably expected us to have at least 15 craftsmanship there. It is possible that they may release new recipes that require very high craftsmanship to access. Command IV & Competence IV are so expensive! Is it really worth buying one to make the offhand? If you intend to go as far as 3 & 4 star, the answer is yes, you should use Tier IV for the Artisan's Offhands. For the Militia Offhands, since they're only a transition, you may get away with less powerful materia. Many people consider buying materia too expensive. Is there another way to obtain those expensive materia? Indeed, spiritbonding crafting tools/gear, then convert into materia is a viable option. All level 48, 49, 50 tools/gears like the Patrician's Coatee or Gloves can be converted into Tier III/ Tier IV crafting materia. They usually turn into Tier III, but once every ~10 times, you'll get a Tier IV. However, the process of generating your own materia is much slower than buying. In my opinion, it's much faster to aim at making a ton of gil, and then buy materia from the Market Board when you see that the price is right. Personally, I do BOTH ways - I actively spiritbond my own materia as well as buying from the MB. Spiritbond Rule (1) - Make sure the gear that you're spiritbonding is HQ. HQ gear bonds a lot faster than NQ. Spiritbond Rule (2) - Melding/Overmeld ANY materia on a gear will make it spiritbond faster. I always meld 2 to 3 elemental tier I or Cunning I materia on my Patrician's Coatee to accelerate the process. Spiritbond Rule (3) - You may wear crafting gear in dungeons to spiritbond them. Spiritbond Rule (4) - Avoid spiritbonding tools/gear that are too high in item level. i55 items are very hard to spiritbond, but they don't give better chances of a Tier IV materia than an i50 or i48. Since Patch 2.2, Master Recipe Books have been added to the game. These recipe books contain the super exciting 3 star recipes, as well as a few special 2 star recipes (a.k.a. 2.5 star items) that is needed to obtain the Artisan Crafting Tools & Artisan's Spectacles. You should NOT be making 3 star items until you have Artisan Tools & Specs (or Artisan's Offhand + Specs). Since Patch 2.2, Artisan Mainhand Tools/Specs have been added to the game for 3 star crafting. Artisan Tools (i70) are your 3rd-most powerful class-specific crafting tools in the game, and Artisan's Specs (i70) is currently still the strongest head gear that can be shared by all crafting classes. Artisan Tools offer 32 more craftsmanship & 17 more control than the original lvl 50 class quest mainhand tool, which is A LOT! Artisan Tools/Specs are obtained from "Talan" again at Rev Toll. To obtain an Artisan Tool for a class, you must possess the corresponding Master Recipe Book, and produce the following 2 star items to exchange for the tool. *Since Patch 2.45, the required HQ items for obtaining Artisan Tools have been dramatically reduced from 50 to 8/10/20. S-E did this to encourage people obtaining all Artisan Tools before Supra Tools. Also, the previous advantages of CUL & ALC in Artisan Specs production have been eliminated. Should I skip Artisan Tools & acquire Supra Tools directly? Since Patch 2.3, new mainhand "Supra Tools" have been added (see Ch22). Supra Tools are more powerful than Artisan. But still, Artisan Tools are worth the time to get, as they're much cheaper & easier to acquire than Supra, yet the power increase is huge comparing with the original lvl 50 class quest tools. As of Patch 2.45, the requirements for obtaining Artisan Tools have been significantly reduced. It makes no sense to try to skip any Artisan to jump to Supra anymore. It is better to obtain them all Artisan first so you get sufficient powers for 3 star crafting. Before you start desynthesizing anything, STOP! Please be aware that you only have 300 points 350 points (changed since Patch 2.5) to distribute among all your crafting classes for desynthesis. Thus, it is CRITICAL that you choose only 3 classes to level for desyn (with 3 classes at level 110, and the remaining 5 classes forced to remain at level 1... they can't go zero... and 15 points left which is useless). Once you raised the level of a class for desyn, it is very difficult to get it back down, and it may screw you over if you change your mind later to level desyn on another class. Please read Namasu's "How to Lock Desyn level & Choose what to Delevel" guide before proceeding. Since Patch 2.3, a kind of skill called "Desynthesis" has been added to the game. This skill allows the breaking down of gear/accessories/fish (NOT crafting mats like ingots or lumbers!) to obtain precious items called "Demimateria" (a.k.a. Damn-it-materia, due to how hard it is to obtain one). "Desynthesis" & "Desynthesis Recipes" are 2 very distinct things. Even with just 1 crafting class at lvl 30, you can already learn "Desynthesis" (The quest for desyn starts at market place of any city). You can then start breaking down things to obtain demimateria. You need to submit 5 Fieldcraft Demimateria I & 5 Battlecraft Demimateria I to "Talan" at Rev Toll to obtain the new "Desynthesis Recipes". Each crafting class has its own unique Desyn Recipe, so you need to do this submission many times to obtain them all. However, if you're only a lvl 30 crafter, you probably cannot craft anything in those recipes. Desyn Recipes are like an extended version of the Master Recipe Books mentioned in Ch19. They're quite demanding in crafting stats. This is because the Desyn Recipes contain items that require "demimateria" to craft. Demimateria are not available in HQ, so most of the times you have to start with very low initial quality. (1) BC1 is used for obtaining Desyn Recipes. BC1 & BC2 are for crafting i90 accessories of DoW/DoM (GSM Desyn Recipe). BC2 & BC3 are for crafting Augmented i90 gear, which are sparking in appearance & in motion (LTW, WVR & ARM Desyn Recipes). BC3 is also used for crafting the new i95 Primal & Mog weapons. (2) FC1 is used for obtaining Desyn Recipes and the new crafting accessories (Dodore Belt, Rose Gold Choker & Mosshorn Earrings). FC2 is used in WVR Desyn Recipe to make items in the Crescent Moon Nightgown set & some furniture. FC3 is for acquisition of the new crafting mainhand "Supra" tools & some exotic furniture. (3) Clear Demimateria are useless. You can treat them as Allagan pieces: You carry them across server, and their value retains, thus allowing you to carry more cash to another server, more than the limit set by S-E.
(4) Mastercraft Demimateria are critical for obtaining the Supra Crafting Tools (See next chapter), and the shared meldable i60 Artisan's gear (Ch25). (5) Demimateria of Inferno/Vortex/Crag & Demimog Demimateria are for crafting the new i95 Primal & Mog weapons. Augmented i90 gear & i95 Primal weapons are widely considered as 3.5 star items. The sparkling Augmented i90 gear has difficulty of 667, requiring one extra Piece by Piece. Despite i95 Primal weapons have only 445 difficulty, they have elemental aspects (similar to vintage items), thus all progress from synthesis are HALFED. This makes them 1 of the hardest items to HQ. Mastercraft Demimateria is necessary for obtaining the new "Supra Crafting Tools" & the shared meldable i60 Artisan's gear. GSM, BSM & ARM are the only classes that can obtain Mastercraft Demimateria. Desyn Recipe in Weaver allows you to craft the Crescent Moon Nightgown set. Alchemist's Desyn Recipe allows you to craft "AF gear Augmentation" (AF gear are the old class quest Artifact Gear, which you were able to wear since level 45). These Augmentation allows dying of the AF gear into any color you want. The desyn of rare big fishes such as the Gigantshark by CUL allows you to obtain glamour items like the Sea Breeze Summer Halter & South Sea Talisman. How do I choose which class to train desyn on? As mentioned before, we can only train up to 3 classes for desyn (3x level 110). GSM is 1 of only 3 classes that can produce Mastercraft Demimateria (MD). It can desyn Artisan's Specs. Artisan's Specs cost less mats than other Artisan's Tools, but produces only 1 Mastercraft at a time, at a rate of about 1/6 to 1/10. GSM can also desyn Artisan's Needle, which produces from 1 to 3 Mastercrafts at a time, similar to BSM & ARM. GSM can also produce BC3 & FC3, although not efficiently. It is the most versatile class. BSM is also very good for MD production, since it can desyn many Artisan Tools, including the Artisan's Chocobotail Saw (cost more mats than Artisan's Specs, but produces from 1 to 3 Mastercrafts at a time, rate unknown - probably also 1/6 to 1/10). It can also desyn a large variety of old primal/mog weapons (i60 to i80 from HM Primals/Mog) to produce primal/mog demimateria. ARM is also very good for MD production. It can desyn Artisan's Alembic & Artisan's Frypan, similar to how BSM works. CRP can desyn a large variety of old primal/mog weapons (i60 to i80 from HM Primals/Mog) to produce primal/mog demimateria. ALC is the only class that can desyn Titan weapons. But it is also perhaps the hardest class to train to lvl 100. CUL is a separate entity. Instead of breaking down food, CUL can only desyn fish. And the goal is to obtain exotic swimwears & minions like Assassin Fry by breaking down rare, expensive fishes like the Gigantshark & Ninja Betta. - Assassin Fry, a minion that will dive itself into water whenever it is above water. LTW is the new class of highest potential & popularity in Patch 2.4. LTW can desyn Best Man's Gaiters & Bridesmaid's Sandals (i70 -> lvl 100 desyn will have 100% success rate) from city vendor for 6K gil each to obtain FC3. We thought this was a glitch before, but apparently, S-E is keeping it in the game. Thus, this class became the most gil & time-efficient class to produce FC3. One of the "byproducts" of desynthesis of Bridesmaid's Sandals by LTW is Spruce Lumber (NQ or HQ). Since Patch 2.45, one of the newest, most efficient way to produce MD appears to be Spruce Plywood HQ (for exchanging into Artisan's Specs or Artisan's Chocobosaw). Thus, these "byproducts" can actually be used for MD production. LTW can also produce BC3 at a reasonable rate. WVR can also desyn Best Man & Bridal clothing for 12K gil each, making it the 2nd most desirable class for FC3 production. It can also desyn a large variety of dungeon drops (especially DoM gear), or crafted i90 gear to generate BC3. WVR also allows you to desyn the exotic swimwear from CUL for super rare items like Waterproof Cotton etc. These rare mats are for LTW to create even MORE exotic swimwear, like the Coeurl swimsuit set. Therefore, if you're a top notch Fisher, you may consider taking CUL desyn, and then later WVR desyn. They'll all fit together into 1 big production of very rare items. WVR cannot desyn any primal/mog weapon. - The glorious moment in Patch 2.4 when we found that the vendor item Bridesmaid's Sandals can be desyn into FC3 by LTW. - By the way, someone asked me how one could get the inventory to look like this. The way to do it is: Character Configuration -> Control Setting -> Character -> Inventory Settings -> choose Expanded. Enjoy! IMPORTANT: The price of FC3 seems to be very low nowadays. You may choose to just buy them instead of training LTW or WVR on desyn to make them. Be ware though, training desyn to level 100 requires sacrificing a crap load of NQ 3 star i90 gear (except CUL & ALC). When I was leveling my GSM, I used at least 60 i90 items to train to level 100. This means >60 NQ Gold Ingot (i.e. a lot of Raziqsand & Native Gold) & >120 NQ Terminus Putty (i.e. Tawny Latex & Filtered Water), plus a huge amount of clusters. (1) If you intend to produce MD yourself, you should train your GSM, BSM or ARM to at least level 100. Why? 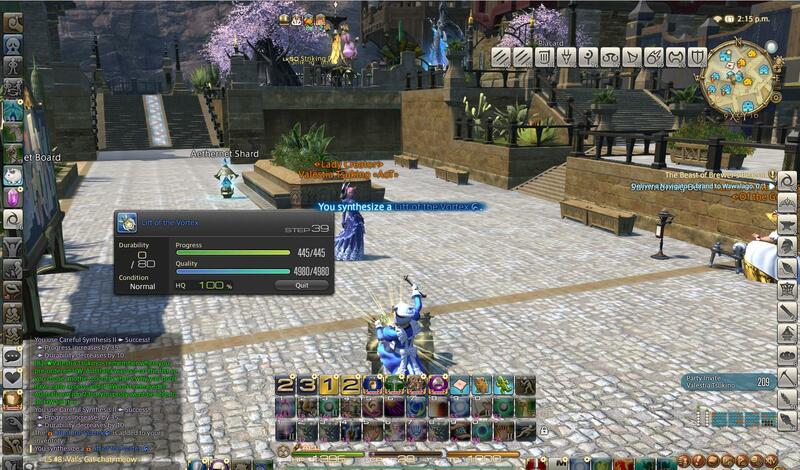 Because at level 100, all i70 Artisan's Specs or Tools will be desynthesized at 100% rate. Really, these Artisan's Specs or Tools take forever to generate, and are very costly. You don't want to botch even a single one. So bite your teeth, and train yourself to level 100 please. Even if you're level 99.96, your desyn successful rate will only be 98.5%. And trust me, when you desyn enough times, that 1.5% will get to you at the worst time, and your Artisan's items will botch more frequent than you believe. (2) Please produce HUGE batches of Artisan Specs / Tools for this production. The drop rate of a MD from a desyn can be as frequent as 1/6 or can be as infrequent as 1/20. It's an RNG game, and the only way to beat that RNG is by sheer number. If you try to desyn 2 to 3 Artisan's Specs per batch, you will very unlikely get a MD. If you go for the Artisan's Specs route, I suggest you prepare at least 2 & 1/2 stacks of 99 Spruce Plywood HQ to exchange for over 60 Artisan Specs all at once. If you go for the Artisan's Tool route (Artisan's Needle for GSM desyn, or other tools to be desyn by BSM/ARM), prepare at least 120 Silver Brocade HQ, and obtain at least 15 Artisan's Needle before you desyn them. There were rumors about how 100% spiritbonded or HQ gear having higher chance of desynthesis success rate. To hell with them! None of them was true! Desyn success rate has absolutely nothing to do with spiritbonding or gear quality. What actually matters is just the melding of materia on a gear! Each materia meld increases desyn success rate of an item by 5%. Therefore, for the desyn of expensive i70 & i90 gear, it is highly recommended that you meld ~4 materia on them. HQ gear does have a slightly higher rate for successful materia melding though. So if you're making the very expensive i70s, and planning to penta-meld them (penta-meld = melding 5 materia). Then you could consider making the gear HQ just to assist in melding. This effort of HQ-ing the item for melds is NOT worth for i90 though, because i90 are 3 star items, which are much harder to HQ. Just make NQ i90, and meld 3 to 4 materia. - Each materia meld increases desyn success rate by 5%. Bacon Broth is a food that can slightly increase desynthesis success rate, which can be useful if you plan to desyn large amounts of expensive gear. This food, however, is a 4 star item. HQ broth adds 5% success rate to desynthesis (Careful Desynthesis +2), but are very expensive. NQ ones are much cheaper, but only adds 2.5% (Careful Desynthesis +1). Tinker's Calm (see below) is NOT a food, but a potion that can increase desyn rate a lot more. NQ ones can increase success rate by 7.5% (Careful Desynthesis +3). HQ ones can increase success rate by 10% (Careful Desynthesis +4). However, because Tinker's Calm is not a food, its effect only lasts 5 min instead of 30 min. NOTE: Since Tinker's Calm is NOT a food, you can actually use BOTH Bacon Broth and Tinker's Calm simultaneously to increase desynthesis success rate! If you use HQ calm + HQ broth, you can increase desyn success rate by up to 12.5%!!! Since Patch 2.3, "Supra Crafting Tools" have been added to the game. Supra Tools (i75) are now the 2nd-strongest mainhand tools, 1 step above Artisan Tools (i70). They are the "Novus Weapons" of crafters. They require a ridiculous amount of grinding or $$$ to obtain, but they do not provide as much power increase. Supra Tools only provide 10 more craftsmanship & 5 more control over Artisan. (1) Reaching 415 craftsmanship (need 11 craftsmanship on the old Militia offhand), allowing the substitute of 1 PBP with a CSII under Ingen II in the making of regular 3 star items (including i95 Mog Weapons). (2) Reaching 410 craftsmanship (need 6 craftsmanship on Militia offhand), allowing the completion of i95 Primal Weapons (3.5 star item) with minimal steps & CP cost. (3) Assists in the making of "3.9 star" Monstrosity Items for the acquisition of Master Recipe Books II. (4) A minimum requirement to craft 4 star items. To obtain Supra Tools, you need to hand in the following demimateria & special 3 star items (NQ) to Talan. *Notice you just need to make these items NQ. They're pathetically easy. The only way to obtain Mastercraft Demimateria is to desyn i70 Artisan Specs/Tools (or Forager Tools). And the only classes that an desyn Artisan Specs/Tools are GSM, BSM & ARM. The best way to obtain Artisan Specs is to make HQ Spicy Tomato Relish (CUL) or HQ Spirits of Salt (ALC). Thus, generating the famous Tomato Rush since Patch 2.3. As of Patch 2.45, HQ Spicy Tomato Relish/ Spirits of Salt are no longer the best way to obtain Artisan Specs. The newest best way appears to be HQ Spruce Plywood or HQ Silver Brocade, since it only takes 4 of them to get 1 Artisan Specs. The famous Tomato Rush is finally over. Spruce Plywood HQ is made from Spruce Lumber HQ, and Spruce Lumber HQ happens to be a "byproduct" of desynthesis of Bridesmaid's Shoes in the production of Fieldcraft III by LTW. Each of those NQ items listed above (like Intricate Silver Brocade) takes 2 Fieldcraft Demimateria III (FC3) to craft. Thus, needing a total of 10 FC3 per Supra Tool. The easiest way to produce FC3 is from desyn of Bridesmaid's & Best Man's shoes & clothing by LTW & WVR. Other classes can do it too, but not even close to their efficiency. However, CHECK Market Board first! Apparently, on some server, they're now DIRT CHEAP. You may choose to just buy FC3 instead of producing them yourself. Once collected all the items, the Supra Tools are exchanged at "Talan" again at Rev Toll. In Patch 2.5, Lucis tools (i90) have been added, and are now the strongest mainhand tools in the game. They are "upgraded" from Supra Tools. Thus, you need to sacrifice your Supra to acquire Lucis. These tools are 31 craftsmanship & 14 control above Supra Tools. You can dye these new tools to any colors you like, including the metallic colors. Although, the tools themselves automatically let most colors appear as semi-metallic. So you don't necessarily need metallic dyes to make them glossy. There are two independent parts to it that involves grinding a total of 928,000 GC seals. Since Patch 2.4, these new recipe books have been added to the game. They contain the brand new 4 star recipes, which contains new i110 crafted gear, minions like the Nana Bear, and furniture like the Armoire. These items have 80 difficulty & 8965 quality. They are harder to HQ than the “3.5 star” i95 primal weapons or Augmented Gear. Hence, I’ve been calling them “3.9 star Monstrosity Items". In my opinion, even 4 star recipes do not match the difficulty of HQ-ing these items. It cost 2 Fieldcraft Demimateria III (FC3) to make 1 of these monstrosities, and there will be many failures. So one should prepare at least 15 FC3 per class. You will need more than a stack of 99 FC3 to get all the recipe books (for methods to acquire so many FC3s, please visit the Desynthesis chapter). The game made these untradeable Monstrosity Items so difficult in order to separate the real skilled crafters from the rest. So people can’t easily buy their way out with gil. You really gotta craft your heart out (However, the recent addition of Artisan's Gear, Artisan's Offhand or even Lucis Crafting Tools have made them a lot easier.). There are many ways to craft these Monstrosity Items, but the most commonly recognized approach is Reclaim. No matter what you do, you will be Reclaiming a lot. You will need to come up with a rotation to hit IQ10 or IQ11, and learn how to “bait” a Good condition on the Byregot to HQ these items. I have also added tips into Ch27 of this crafting guide. Notice that the new 4 star recipes in these Master Recipe Books II have a VERY high requirement on craftsmanship & control (451 craftsmanship & 407 control!!!). Thus, even after you have successfully made 3x HQ 3.9 star Monstrosities, and acquired the new recipes, you must still possess the new Artisan’s Offhand with overmelds before you can craft any 4 star items. The new offhand is a giant leap of power. Each Artisan's Offhand provides 32 more craftsmanship & 17 more control over the old Militia Offhand. Even unfinished with melds, the new offhand will outmatch the old Militia Offhands with full melds. The new offhand is not required to make the 3.9 star Monstrosity Items, but it definitely helps. I was rushing to get my recipes, so I made all those 3.9 star items without the new offhands, proving that it’s doable without the new Artisan's offhand & without Artisan's gear, but just a Supra Tool. But if you have a lot of trouble with them, you can wait until you possess the new offhand before acquiring your Master Recipe Book II. The "shmi60" (Mitts/Culottes/Sandals) provide only very minor increase of stats. After fully-melded, these Artisan's gear only provide 3 extra control each over a fully-melded original i55 class-specific gear. However, you cannot max them all with the 5 available melds. So you have to sacrifice either 2 control, 6 craftsmanship or 3 CP. If you follow my melding method of sacrificing 2 control, then your final apron will have 11 more craftsmanship & 1 more control over the old i55 chest. The Artisan's Offhands are crafted from regular 3 star recipes that require 6 Ehcatl Sealants from the Ixali Beast Quests to make; whereas the shmi60 are 4 star recipes that require 3 Ehcatl Sealants & 1 Mastercraft Demimateria each. ...to fulfill the strict requirement of 451 craftsmanship & 407 control. The game basically forces us to meld the new offhand. If we don’t meld it, we can’t even touch the 4 star recipes that we have acquired! You can't really use food to boost craftsmanship nor control since you need to use Bouillabaisse HQ for CP. Luckily, there's FC buffs & the Ehcatl Smithing Gloves! If you don't have enough craftsmanship or control, FC buff can allow you to temporarily get above the requirement. The Ixali gloves can also provide 3 extra control over your class-specific gloves. With the help of these things, you can then access 4 star recipes, test them out using the most economical way, and then make your own shmi60. I suggest first obtaining the Artisan's Offhand for BSM (Artisan's File). This way you can have more confidence in making the remaining offhands for other classes. Next, followed by Artisan's Offhands of CRP, WVR, & LTW (in this order), which will allow you to craft the 4 star recipes of the Artisan's Apron, Sandals, Culottes & Mitts respectively (with LTW being least prioritized because Ehcatl Smithing Gloves already provides the same amount of control as the Artisan's Mitts. The Artisan's Mitts are only 3 CP better than the Smithing Gloves. CRP is prioritized before WVR because CRP can make GSM & WVR offhands!). WVR is also good, because you can then make your own Artisan's Apron early, but the Apron does not provide as much extra power as the Artisan's Offhand. The shui70 added in Patch 2.5 (Gown, Fingerstalls, Chausses, Pattens) are obtained from Talan at Rev Toll. You need to hand in HQ 2.5 star 80 durab items to acquire them, similar to how you obtain Artisan's Mainhand Tools & Artisan's Specs. The stats of these shui70 gear are not bad at all. Altogether, they have only 1 less craftsmanship on the chest, and only a slight bit less control & CP than fully-melded i55. What does this mean? From now on, no one has to overmeld materia on 8 classes, ever, ever again (except the class-specific Militia Offhand, which you may still slightly meld it if you find yourself lacking a bit of stats). What you need is only 1 SINGLE class with i55 AF gear melded to near max, acquire the strongest shared accessories and meld them to max, do your Ixali for sealants & Ehcatl Smithing Gloves, craft your HQ 2.5 star turn-in items, and exchange for these i70 gear. Once acquired, you can use these gear for all 8 classes, and save yourself from any further melds. You do, however, need at least a few level 50 classes to make your own HQ 2 star 40 durab items to acquire Master Recipe before you have access to the HQ 2.5 turn-in items. The shui70 are weaker than the shmi60. So the shmi60 are still currently the BiS. However, young crafters have no way to acquire those Mastercraft Demimateria to make those shmi60. The shui70 presents itself as a wonderful transition gear for someone to take on 3 star crafting. With the power to do 3 star, one has the ability to train desyn to level 100. And with the power of desyn & the power to massively produce HQ 2.5 star items, one can produce one's own Mastercraft Demimateria, for the acquisition of Supra Tools & the shmi60. Unfortunately, the shui70 are not desynable. As you can see from the above picture, the desynthesis option is not available on these gear. Thus, they cannot be used for Mastercraft Demimateria production. In Patch 2.4, Ehcatl Sealants have been added to the game. We need a ridiculous amount of these sealants to make the new crafting offhands & meldable Artisan’s gear (& gathering offhands/gear too). And this is 1 of the major reasons why we need to do Ixali quests every day. Since we have 8 crafting offhands & 4 new artisan’s gear, 8x6 + 4x3 = 48+12 = 60 sealants needed. Each sealant = 8 oaknots. Thus 60 sealants = 60x8 = 480 oaknots. Since Patch 2.5, we can get 9 oaknots per day, so it's approximately 1 sealant per day. To be exact, we need 480/9 = 54 days to get enough oaknots for all the sealants we need. That’s nearly 2 months (and we’re not including the new gathering offhands yet)! In this section, I will list out clues on how to craft ALL starred items. I will try my best NOT to just give away my rotations here, or that will just completely ruin your fun! Instead, I’ll give each of these items an overview, and just try to give some suggestions/tips on how to make them. Then it’s up to you to solve the puzzles. For the most difficult ones, I do have some rotations here listed under spoiler tags. Just remember that there are many different ways to craft things. My rotations are not necessarily the best for you, so you may need to modify them to suit yourselves. It helps a lot in predicting whether you can complete your remaining progress as well as quality outcome. e.g. Twinthread, Rose Gold Nugget, Darksteel Nugget, Spruce Lumber etc. This is your 1st real challenge after you have achieved All-50 & gotten the “Builder of the Realm” title. I understand that any single fresh lvl 50 can do this with the help of HQ mats. But HQ mats for these items are relatively rare. Plus, since these items are so widely used post-lvl 50, it’s quite important that you are able to make HQ ones from pure NQ mats. Then when you gather, you can use King’s Yield II instead of Unearthed II, allowing you to get up to 25 ores/logs per round instead of just 15 or 18. This difference in numbers may not sound like a lot to you. But you need to understand you may eventually need to make hundreds of these nuggets (for sales to sustain your high income to make up your high expense, to provide mats for higher lvls of crafting, & also to help obtain your Artisan Tools). You may run through stacks & stacks (1 stack = 99) of ores/logs. So small differences in numbers per gathering round really do add up. So master the way to make these items from NQ mats. It is very obvious that the key to HQ-ing this is by powering your Byregot. Try to come up with a rotation that can fully power your Byregot with as many touches as you can squeeze out, and then 1-shot it with a Careful Syn II. If you're really lacking stats, especially CP, you can try to use Hasty Touches to buy more CP. However, this is problematic, as Hasty Touches are very risky. There is a way to make nuggets from pure NQ mats at nearly 100% fidelity, and you DO NOT need to use a single Hasty Touch. All you need is 324 Craftsmanship, ~340 control & 349 CP (This is very low stats requirement. You don't need Artisan Offhand for this.). All you need is only Inner Quiet Stack 6 to HQ this item from pure NQ mats. Unless your stats is really low, otherwise, you don't need to push IQ to 8 to 9 by over-using Hasty Touches. I really, really strongly recommend you to polish your rotation here so that you get ~100% fidelity every time from pure NQ mats. The same rotation you developed here will be directly used for 2 star 40 durab, and can also be tweaked into other rotations for 1 star 80 durab items, 2 star 80 durab items, and even 2.5 star HQ turn-in items for acquisition of Artisan Mainhand tools. You really need to learn how to make these nuggets without a single Hasty Touch... please. Don’t overly bang your head on using Waste Not. Try another similar skill... a skill that I mention in my crafting guide that may be better than Waste Not for 40 durab items. Think of a way to maximize the power of your Byregot. All you need really is just Inner Quiet 6. Use Control food to help (or CP food. See below.). FC control bonus buff will also be very helpful if you’re still weak. "In Control" (cost about 2K FC credits) adds 5 control, and "In Control II" (cost about 6K FC credits) adds 10 control. These bonuses can be significant to a fresh all-50. Don't forget to use Comfort Zone. You should have very few CP left when you complete the item. (Apart from Control food, you can potentially use CP food too. But if you use CP food here, you'll need to modify your rotation later for 2 star 40 durab items, because you probably need to eat craftsmanship food to make 2 star 40 durab items. If you use CP food for 2 star, you will need 20 durab to complete the item instead of 10 durab like you have here with 1 star.). When you are lacking stats, you can try to use Hasty T's, and use CP to buy more durability to increase Inner Quiet for a stronger Byregot. Alternatively, you can first use a few Hasty T's to save enough CP for an Advanced Touch before the Byregot. This will also help with quality. But Hasty T's are, after all, risky. When you have enough stats, you should be able to completely omit the use Hasty T's, leaving only Basic & Standard T's. When you are able to do this, you will be able to consistently make HQ nuggets from pure NQ mats at 100% fidelity. Keep in mind that Ingen II is the key to 1-shotting it. So you need it active for the Careful Syn II at the end. Ingen II is also capable of slightly increasing quality. So try to have your Byregot wrapped under all those Steady H/Steady H II, Great S, Innov & Ingen II. If you plan it carefully, you can actually have an extra touch wrapped under all these buffs right before the Byregot (except Great Strides), and still have 1 step of Ingen II left for the Careful Syn II. e.g. Champion's Lance, Aeolian Scimitar, Weaver's Gloves, Miner's Shirt etc. Once you have mastered the 1 Star 40 Durab, these will be just cake for you. Needless to say, now that the durab limitation is much relaxed, of course you can freely use Waste Not to your likings. e.g. Vanya Silk, Darksteel Ingot, Rose Gold Ingot, Hard Hippogryph Leather, Treated Spruce Lumber etc. I have recently received a large amount of crafting requests from people asking me to help them craft these items, so that they can acquire the Master Recipe Books. If you're one of these people, please listen to my advice here. If you cannot make these items yourself, it is pointless to acquire those Master Recipe Books. Inside the books are all 3 star recipes, and 1 special 2 star recipe (2.5 star items). If you can't make a Vanya Silk HQ yourself, you can't really make Silver Brocade HQ anyway. So all you can do is just look at the recipes and do nothing. If you had listened to my advice and polished your 1 star 40 durab rotation earlier, you now have something powerful in hand to work with, and you can directly apply the same rotation here for these Vanya Silk or Darksteel Ingots. Frankly, before you have Artisan Tools/Specs, these are quite difficult to make HQ. But you NEED 5 of these items HQ to get your Master Recipe, & you need Master Recipe to get Artisan Tools. So apparently, you will have to make them without Artisan Tools first. From the above data, we can deduce that every 3 craftsmanship give 1 extra progress for Vanya Silk or items with same difficulty. Hence, the minimum craftsmanship is 390 to 1-shot a Vanya Silk. This amount of craftsmanship can be easily achieved if you have the Artisan Tools, but it is almost IMPOSSIBLE to achieve with only a few materia overmelds. This is why one NEEDS craftsmanship food, (like Rolanberry Cheesecake HQ or Shark Fin Soup) to make these 2 star 40 durab items (now you start to appreciate the power of CUL 50). But now, if you're using craftsmanship food, you cannot boost control with control food. Therefore, one should use as many HQ mats as possible, and request FC control buff as well. Once Artisan Tools are obtained and your craftsmanship is above 390, then you can use control food instead, and these items will become a lot easier. Rolanberry Cheesecake HQ adds up to 40 craftsmanship. It is the classic food for a non-Artisan Tool crafter to craft 2 star 40 durab items. As long as you have at least 350 craftsmanship, you can use this HQ food to achieve 390 craftsmanship. Shark Fin Soup is a new food added to the game recently. It adds even more craftsmanship than Rolanberry Cheesecake, and it adds CP as well. I have never used this since I am way passed that point of needing food to make 2 star 40 durab items. It is a 3 star item though, and the ingredients (the Megalodon) are extravagant. But NQ Shark Fin Soup are not too expensive on the market. NQ Soup adds 10% craftsmanship, and total of up to 49 craftsmanship in theory, but you can never max it, because you will need 490 craftsmanship to gain that 49. Thus, if you plan to use this to achieve 390 craftsmanship, you will need at least 355 craftsmanship. Then the soup will provide 35 craftsmanship, giving you a total of 355+35=390. Once again, when you have mastered the 40 durab items, 80 durab items are cakes. Just a reminder that the higher level is the item that you’re making, the more essential Ingen II is for synthesis. So try to use Ingen II right before the Byregot (unless you're at Good or Excellent condition right before Ingen II) so that the Ingen II covers both the Byregot and the remaining synthesis steps. In some cases, if you have extra CP & durability left, you may even add an extra phase of 2 more touches under Steady Hand II to further power your Byregot. A Byregot under IQ8 without Innovation is actually more powerful than a Byregot under only IQ6 with Innovation. So you may consider skipping Innov to pull more CP for more touches if durability allows. Just do your calculations. These are the 2-star items required to obtain the Artisan Tools and Artisan Spectacles. They are very demanding with quality, and should be considered "2.5 star". You should try to use as many HQ mats as possible. Yep, that just means you need a ton of Darksteel Nuggets HQ/ Twinthread HQ etc. Once again, didn’t I tell you to master the 1 star 40 Durab items? Now you see why I said you may need to make a lot of those… Anyway, just keep in mind here again that Ingen II is absolutely critical for the Byregot and for the synthesis. You can’t get away with that. To assist in making these items, you may choose to use Control food or CP food. The rotation you use will obviously be different if you select either food. - Dagger Soup or Pan-fried Mahi-Mahi are very strong Control food. HQ Dagger Soup adds up to 27 control if you have >270 base control. HQ Mahi adds up to 31 control if you have >310 base control. - Bouillabaisse is the strongest CP food. HQ adds up to 43 CP if you have >331 base CP. The use of Bouillabaisse HQ will probably allow you to get a higher IQ stack, thus making the Byregot a lot stronger. It is, however, a pretty expensive food to use. After you have acquired the Artisan's Tools/Specs, when you need to make thousands of Spicy Tomato Relish HQ for obtaining Mastercraft Demimateria for Supra Tools, it's better to macro the rotation. When you need to make THAT many Relish, the use of Bouillabaisse HQ maybe too wasteful. Below is a macro which gives 100% HQ Relish when using HQ Dzemael Tomatoes & HQ Dark Vinegar (you must already have Artisan's Tool/specs & a strong offhand). Congratulations! If you reached here, you’re quite a master already! Yet, the true challenge still lies ahead! 3 Star Crafting is not for the squeamish. 3 Star Crafting should NOT be done before you obtain your Artisan Tools/Specs. When you first do this, you will be surprised how each of your puny little touches or synthesis will give rise to almost nothing. Yet, don't be afraid. 3 star is very doable. Just as I suggested in the first sentence of this guide, it all comes down to whether you can make the most out of your stats. Can you utilize all those cross class skills in your hands? Can you utilize the build/ the strength of your Offhand? Firstly, I can guarantee you that you will have at least a few failures before you can get this right. Unfortunately, 3 star crafting mats are quite expensive. When your 3 star mats are sold by Grand Company (9K GC seals), from dungeon drops, or from 2 star gathering nodes, you know you’re in trouble. My 1st advice to you, is the same 1st advice I got from my Sensei Nabeshin: Practice 3 star with CUL before trying anything else. CUL mats are much more affordable, and it’s the only way to “practice” before the real thing. Canard Breast & Dalamud Popoto are pretty cheap for 10 pieces. So you get to practice 10x with minimal spendings. That’s much more affordable than buying a Scheelite or Cashmere Fleece. 2 star gathering mats are also very cheap if NQ (whereas HQ is VERY expensive). So just easily pick up some NQ mats from the market board, and you can start cooking. My 2nd advice to you, is to use Piece By Piece (PBP) before you do any Careful Syn II (CSII). PBP completes 1/3 of the remaining progress in 1-shot. So naturally, the more is your remaining progress, the more powerful PBP becomes. Each time your remaining progress reduces, the power of PBP reduces respectively. When it reaches a point that it provides less progress than a CSII under Ingen II, then you know you have overshot the limit of it, and you’ll have to complete the rest with CSII. Thirdly, you'll find yourself not having enough CP. Bouillabaisse HQ, which adds 43 CP, is now the standard food for 3 star & 4 star crafting. Even with food, some Hasty T will be unavoidable. Yet, when HTs are involved, fidelity will always be a problem. That’s right, no one can have 100% fidelity on 3 star crafting. Everybody will depend a bit on luck when they use HTs. But at the end, what separates the best crafter out of the 2nd best is whether you can minimize the use of HT. If you can figure out a way to use fewer HTs, then you will have a bigger chance of HQ-ing the item, because each Inner Q stack is extremely important. 1 less touch due to a failed HT will make a big difference in the final outcome of the Byregot. Since Patch 2.5, people's stats have gone outrageously high. The way to craft 3 star items have changed considerably. Yes, Rapid Syn is only 80% success rate under SHII. Chances are that you will fail one of them. But even if you fail Rapid Syn TWICE, you saved yourself 15 CP from PBP, and 32 CP from Ingen2. Meaning that you can now have an extra 47 CP to work with. With our already high CP pool now comparing to the past, most of the time we can add in an extra Comfort Zone (a 3rd one), resulting in another extra 14 CP. The longer the process is, also means more chances of Trick of Trades. In the end, it is very likely that we have soooo much CP that we can add in an extra Manipulation / Master's Mend / or Waste Not. This means we're likely to be able to touch 2 to 3 more times. This is a big deal, as the difference between IQ8 vs IQ10 is dramatic. If you get lucky, and all Rapid Syn landed, then you gain an extra touch too because it's 1 step shorter than the older rotations. With this rotation, you can even get away with NOT using any food at all too. *NOTE: If your craftsmanship is higher than 500, then you CANNOT use the 3rd Rapid Syn, because 3x RS would have completed the item. So far, one of the most difficult 3 star items to make is TERMINUS PUTTY HQ. The starting mats for putty are only available in NQ. So you are forced to start off your synthesis at zero quality. If you can hit >85% quality over 4/5 of the times, that's already very impressive. Luckily, we don’t need HQ putty to make HQ 3 star gear in this game. So don’t push yourself too hard. Don’t just have your head stuck with Waste Not & Manip! Try something like Master Mend II! Also, have you considered using Comfort Zone more than once? The final Byregot phase will consist of all the buffs you can pull out from your arsenal, but depending on CP, you may or may not include Innov. You should have Ingen II activated right before the Byregot, so that you can complete the craft with the remaining steps under the same Ingen II. There are at least 2 approaches to 3 star crafting. One is going for less power but higher fidelity, the other is going for higher risk but stronger power. For a 3 star GEAR (which is a final product, like Heavy Wolfram Helm or Saurian Belt of Striking), it is recommended that you use as many HQ mats as possible, and go for less power but higher fidelity. This is because if you fail to make this final product HQ, all precious mats are wasted. The key to consistently HQing a 3 star GEAR is to minimize the luck factor. Sometimes, you may be lucky enough to have so many Trick of Trades to use numerous Waste Nots, allowing you to hit Inner Quiet (IQ) 11 (max) just by pumping countless Hasty T. But that probably happens only once in a blue moon. You see, the more HTs you use, the less fidelity you have, and your chance of hitting high IQ will depend more on luck. This is NOT what you want to do for a 3 star GEAR. Why? Because each time you fail a HT, the lost durability is UNRECOVERABLE. Each lost touch is basically 1 IQ less in the end. Therefore, to achieve a rotation of higher fidelity, one should try use as few HTs as possible, and substitute them with as many Basic Touches (BT) as possible (under Steady Hand II). Try using NO Waste Not at all, but save all CP for Master Mend II & Basic T's. So it all comes down to calculations: Depending on how many CP you have gained after the first few buttons, you will be able to calculate the number of HTs & BTs you can afford to hit IQ9. Let’s say, your current CP value can afford 5 HTs & 3 BTs, aiming to hit IQ9. You will then start off with only 2 or 3 HTs, and then move on with BTs, and “anticipate/bait" for more lucky Trick of the Trade later. If luck does come, you can then continue to use more BTs until everything else becomes BT. So in the end, you may only have used 2 or 3 HTs, i.e. you may end up with something like 2x HTs + 5x BT + 1x HT (only 3 HTs, thus, high fidelity!). If luck does not come, then on your last few touches, you need to go back to using HTs so that you can still have a chance to hit IQ9. You will end up with something like 2x HTs + 3x BTs + 3x HTs. For a 3 star MAT like Terminus Putty HQ, it is recommended that you go for a rotation of higher risk but stronger power. This is because all the mats for making Terminus Putty are only available in NQ. So you have to start your synthesis at quality zero. With this prerequisite, an 8-touch rotation is simply not powerful enough to HQ it. You need at least 9 touches (IQ 10) or even 10 touches (IQ 11) to do so. In this case, sacrifice most of your BT, and substitute them with HT to buy an extra Waste Not. This will require an extra Trick of the Trade, so good luck with that! For a 3 star MAT like Cashmere Cloth, Wolfram Ingot or Saurian Leather, you may choose between the 2 approaches, depending on whether you start with an HQ Diluted Vitriol, HQ Ferberite & HQ Shroud Tea Leaves. No more hints! Just give me the damn rotation already! e.g. Camlet, Lapdog Collar Bell, Enchanted Quicksilver, Fluorite Lens, Mummer's Daggers, Duck Broth etc. In Patch 2.5, 3 star 40 durab items have been added as "turn-in" items for the acquisition Lucis Tools. You need 20x HQ crafted items per Lucis. These 3 star 40 durab items are not as hard as the 3.9 star monstrosities for acquiring Master Recipe II (listed below), but they're still reasonably hard. Their quality bar is 4980, which is exactly the same as 3 star 80 durab items. The good thing is, NQ ones can actually be handed back to Talan at Rev Toll to fully get back 3x GC untradeable mats and 1x the most expensive mat. So it's actually better to NOT use Reclaim like we did for the 3.9 star (because either way, you lose all your clusters anyway, but Reclaim only works 90% chance). And since we're not adding Reclaim in our cross class selection panel, we can now add 1 extra useful cross class skill for our synthesis. This is wonderful & exciting, as we were desperately out of cross class skill slots for 3.9 and 4 star items. What S-E did here opened up opportunities for us to create even more complex, more interesting, more flexible rotations! Concerning rotations, I'm not gonna talk very much here to ruin everyone's fun. Let's just say, S-E this time gave us a challenge to force us to learn how to use Manipulation properly. Manipulation is practically the SOUL of this. I've always said in my crafting guide that Manipulation is a wonderful skill for high level 40 durab items (We veteran crafters recognized this as early as Patch 2.0 & 2.1. Check out this post I made before Caimie's crafting guide even exists!). And here it is in Patch 2.5, S-E wants us to put it into full use... and in conjunction with other skills... to a point even I am learning a lot from this. Everyone knows how to click that Manip button. But when is the best time? There are some basic rules to it, but it's still pretty variable. The key, is always keeping an eye on those icons above the screen, pay attention to when Comfort Zone or Steady Hand II are falling off (this affects WHEN to activate Manip), and also pay attention to how much durab is remaining (this also affects WHEN to activate Manip). Then make your judgement. Most of the times, deciding WHEN to activate Manipulation will determine whether you can HQ that item or not. For these items, we can at most get around 400 initial quality with HQ mats, which surprisingly, actually made a difference for me sometimes (for my GSM). However, I still tend to avoid expensive HQ mats like HQ ferberite or HQ shroud tea leaves. I did my BSM and LTW starting from zero quality and it was still fine. I used HQ mats for GSM because it only asked for HQ Siltstone Whetstone & HQ Basilisk Whetstone, which are just so easy to make or even cheap to buy. - My average was about 16 to 17 /20 HQ. Best record was 19/20 HQ. I started off with CUL, thinking it would have been cheaper like how the old 3 star in Patch 2.2. But not really... In reality, it wasn't cheaper at all. There is no class that is specially cheaper and can be used as a practice (But there are classes that are particularly expensive like BSM & ARM, which involve Scheelite.)... Well, it all comes down to which class you have the most mats available, or cheapest on the market board. 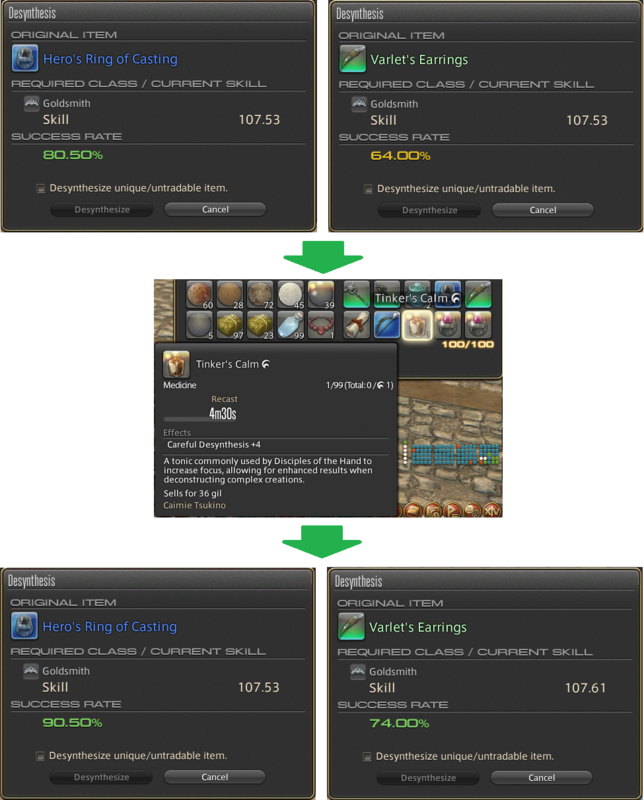 Since there is no "practice class", the crafting simulator from http://ffxivcrafter.com/ actually do helps quite a bit, especially with completion predictions. So far, the simulator is telling me that a critical craftsmanship level occurs at 467, where Rapid Syn can be used once alone, and then a CS II under Ingen II can wrap up everything. We obviously don't have that much craftsmanship level. Even with my new Artisan's Apron, and with my Artisan's Offhand with 2x Competence IV + 1x Competence III, I'm only having 464. Other people who did 3x Competence III will only have 462. But with the help of FC buff, we can gain an extra 5 craftsmanship, and that should be theoretically enough even if you have only 462 craftsmanship (I never tested this though!). If you don't have the luxury of FC buffs, it's ok. You can still make this item, but you need Ingen II to cover that Rapid Syn of yours. Thus, you will have to use Ingen II very early so that if your Rapid Syn fails, you can still mend it. After that, a CSII alone at the end can finish it. Don't put Ingen II, Rapid Syn and CS II all together at the end, hoping Ingen II to wrap the Byregot. It's not worth that risk of botching with a late Rapid Syn. Alternatively, you can use 3 steps for completion... Rapid Syn, CS II, CS II is a viable completion method as well especially if CP is an issue, but durab is not. Interestingly, I am finding the need for a few more CP in the making of these items. So I melded 3 more CP on the last slot of some of my classes' offhands. It really did help! But I don't know if this is a wise choice or not until the next patch or Heavensward arrives. Usually, activating Manipulation when durab is 20 or 15 is the best. This way, if the condition is "Good" after activating Manip, you can take a Trick of Trade, and just let durab increase by 10. In contrast, if the condition is "Excellent", you can do a touch instead. Thus, this arrangement allows maximum flexibility, because sometimes 2 Trick of Trades do come up before Manip's 3 steps run out, which will gain back a full 40 durab (or 35 durab), and not have any durab wasted. However, if you foresee that you will be using the Steady Hand II button or Comfort Zone button right after Manip, then you actually want durab to go down to 10 or 5. This way, when you use SH II or CZ, your durab will rise back to 20, and still allows the flexibility of taking 2 Trick of Trades. Depending on how many Tricks I got, I sometimes even use a 3rd Comfort Zone. From my experience, I dare say, if you have >190 CP when your 2nd CZ falls off, you can feel pretty comfortable throwing down a 3rd CZ right there, before proceeding to another round of Manipulation (or Waste Not). One major decision near the end, is to judge whether you have enough CP for another round of Manip or not. If you're sitting on IQ7+, and u have ~150 CP left, 35 durab left. That is obviously not enough to do more CZ or Manip. What I will do is activate Steady Hand II, pop Ingen II, then push out a Hasty under the Ingen II, push out a Basic T under the Ingen II, Great Stride and then Byregot, and leaving 1 round of Ingen II for the CSII to complete the item. I will not be able to take any Tricks during this final phase, nor will I have any CP left for baiting a Good on the Byregot, but I can be pretty comfortable with my last 2 touches slightly buffed by Ingen II, reaching IQ9+ for the Byregot, and ensuring completion. If you need 2 CSII's to complete it, you could leave out 1 touch in the above arrangement, and you will have 2 steps of Ingen II at the end for 2x CS II. Another major decision near the end, is if you wanna try push out more IQ stack. Let's say, I have only IQ6 this time, ~150 CP and 35 durab, the above is obviously not going to generate sufficient power (IQ8 or less). I will then do Steady Hand II, Waste Not (2nd time in the rotation), and then 4x Hasty Touches. Case (1): If there is no Trick of Trades, this will lead me into trouble, as I will reach IQ10 (or IQ9 if one failed), but only 15 durab left with 69 CP. This is not enough to do Great Strides, Ingen II, Byregot, CS II. But I can still BAIT for the good at this point. I will activate that Ingen II first to ensure completion, and hope a Trick pop up right there. If it does, take it, and then do the Great Strides, Byregot, and the finish with CS II. Case (2): If there's a Trick right before the WN, take it! This will mean reaching IQ9, leaving 1 step of WN hanging at 20 durab without Steady Hand II covering. Use that step to do a CSII first. This leave 15 durab left and 59 CP. But I no longer require Ingen II for completion. I can now comfortably push out Great Strides + Byregot (but only at 90% success rate, and I have failed this before too), and finish up with a second CSII. Case (3): If the Trick comes during the 4 steps of WN, take it, and Hasty Touch 3x only (reaching IQ9). I will have 20 durab left, but I have enough CP now to perform Great Strides, Ingen II, Byregot (at 90% success rate), and then finish up with CSII. The difficulty of making these augmented gear is that they require 1 extra Piece by Piece. That means 15 less CP & 10 less durab to work on quality. Also, the amount of initial quality you can get from HQ mats is very small. This means you are forced to use a risky rotation with almost all HTs to try to squeeze out more touches. But at the end of the day, it's just a glamor item. I'd not use Reclaim on it since it's too risky to lose all those precious demimateria. Completion is more important. This is basically the same as the 3 star completion method listed above except adding an extra PBP at the front. This completion method saves a lot of CP, and can also potentially save a touch. Once again, the additional CP could potentially become an extra Comfort Zone (3rd), which means even more CP to potentially add an extra Manip/MM/WN. i95 Primal Weapons are currently the 2nd-most difficult item to HQ in this game. Due to having Elemental Aspects, all progress are HALVED. They kind of qualify being called "4 star" in my opinion. You need at least 410 Craftsmanship to complete the item using Elemental Brands. And if you are a 4 star crafter with >453 Craftsmanship, it's even better since you don't need to use the Elemental Brands. - Please be careful that "i95 Mog Weapons" are NOT considered "Primal Weapons". Mog weapons have no elemental aspects. Thus, they are just regular 3 star items! I came up with this number by testing on regular 3 star mats, and then confirmed the results by crafting actual i95 weapons. To achieve this, I recommend the acquisition of the "Supra Tools", maxes out ALL stats (including those +1 craftsmanship on pants & boots) on ALL gear with overmelds, and possess at least 6 Craftsmanship on the old Militia Offhand to make up a total of 410+ Craftsmanship (or you can simply own the new Artisan's Offhand, and your craftsmanship will be way over 410). To counteract on the elemental aspect problem, you can make use of the "Elemental Brands" or even Rapid Syn. However, Rapid Syn is way too risky. As you can see from the pics in the Desynthesis chapter above, it takes 3x Primal Demimateria, 10x Battlecraft Demi III, & 1 special item from Extreme Primal to make such a weapon. Failing is NOT an option! Worst case scenario, make it NQ! DO NOT use Reclaim! Since there's simply no room for "tests", please use the above test results to plan your rotation. You will need 3x Piece by Piece if you don't have the Artisan's Offhand. Also, REMEMBER TO THE VERY DEEPEST OF YOUR HEART, THAT YOU WILL NEED TO SAVE 15 CP FOR THAT ELEMENTAL BRAND. ADD 15 CP TO YOUR FINAL BYREGOT PHASE'S CALCULATION! This is very different from regular 3 star crafting. If you fail to remember this, you will fail the completion of the weapon, and waste over 8 million gil of mats. In summary, comparing to a normal 3 star item, you have 30 CP less & 10 durab less to work with. Also remember, that Byregot and Elemental Brands have only 90% success rate. So try to have a Steady Hand before both of them (Actually, I once did the Byregot & Brand without a SH to pull enough CP for Great Strides. It eventually paid off, but such a big risk... my heart nearly popped). (1) Did you load up the appropriate cross class skills including the Elemental Brand? (2) If you have more than 1 offhand, are you using the appropriate one? (3) Check craftsmanship to make sure it's over 410. (4) Did you request the appropriate FC buff? (5) Did you eat your Bouillabaisse HQ? - To HQ an i95 weapon really needs both skills & luck. Indeed, Rapid Syn are risky, but you can now do it early under Ingen II, and you won't need Ingen II again at the end for the Careful Syn II. With 1 less PBP and without the need of Elemental Brand, you will be saving 30 CP & 1 extra step for quality, which is a biiiggg biiiggg deal. Even if 1 Rapid Syn fails and took an extra step, you're still gaining 30 CP... totally worth it! After acquisition of Lucis Tools, our craftsmanship goes to around 495. I found that at 495 craftsmanship, Rapid Syn under Ingen2 would give rise to 101 progress. Thus, the rotation for 453+ craftsmanship won't work. It'd complete the item on the 2nd Rapid Syn under Ingen2. If you have 495 craftsmanship, you can actually omit the Ingen2 entirely from your rotation. So you can remove it from your cross class panel, and substitute it with something else more useful, like Innovation or Manipulation. Rapid Syn alone gives 73 progress. So you do need an extra CS II in the end. But omitting the Ingen2 from the rotation saves you 32 CP, which can be utilized for something else, like a 3rd Comfort Zone plus an extra Manipulation in your rotation, which potentially gives 3 extra touches. If, by chance you need to use CS II under Ingen2, it gives 48 progress... just so you know. 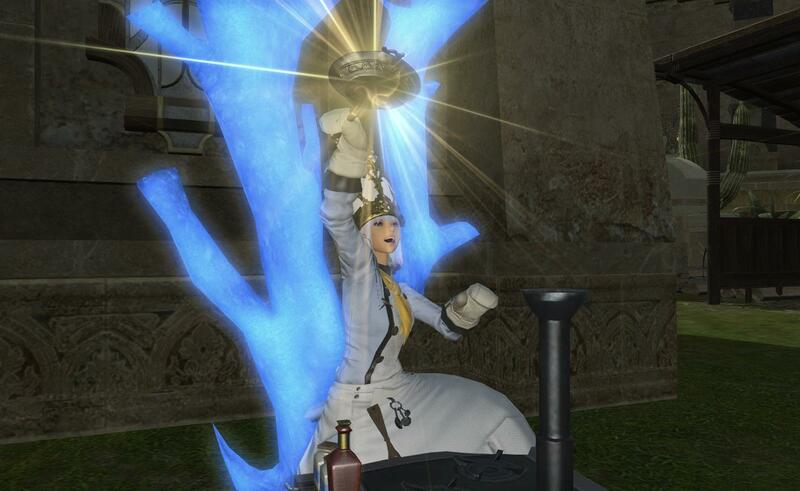 - Newest i95 Primal Weapon, Lift of the Vortex, for the Astrologian in Heavensward (today is 19th June 2015. The weapon is so new that it is not googleable yet!). Our crafting rotation has been changing so much every time our stats increase... We gotta stay on top! e.g. Rich Tomato Relish, Intricate Silver Brocade, Concentrated Spirits of Salt, Balanced Darksteel Hook, Reinforced Darksteel wire etc. These "Monsters" are currently the most difficult item in this game to HQ. They are harder than the 3.5 star i95 Primal Weapons, thus I call them "3.9 star". They are even harder than 4 star recipes in my opinion. "Reclaim" is a skill that you MUST load up for making these items. You will be Reclaiming a lot. Another skill you will need is "Rapid Syn". You need it to shorten the completion steps, to buy more steps for quality. You will need to somehow reach IQ10 or IQ11 to even have a chance to HQ it. If you're only having IQ10, you will need a Good condition on the Byregot to get the job done. IQ9 is hopeless. Even a Good condition on the Byregot will not help if you're only at IQ9. *NOTE: NOT all classes can fit all the Cross Class Skills listed in these rotations. For e.g. GSM lacks 1 Cross Class Slot. In that case, you will have to sacrifice 1 skill. It can be Waste Not, which you sacrifice the chance of 2 extra touches for 56 CP (but you can still add more touches with Manipulation), or it can be Reclaim if you're confident. You may even sacrifice Rapid Syn, and save up more durability in the end for completion with more Careful Syn II under Ingen2. It's really up to you! Be flexible! Notice that although GSM has 2 less touches without Waste Not, it has a natural "Innovation" which you can utilize in the final Byregot phase. This is a luxury which other classes don't have. The most important thing is really not about the inflexible rotations, but the way to improvise and think on the spot. This is because there will be numerous failed Hasty Touches. But if you have been taking many Trick of Trades at suitable positions, you have a chance to mend it. Usually, I'll end up with a lot of extra CP near the end... It's a choice to make whether to use all Hasties or swap one or two into Basic T. And this "choice" kinda distinguishes you from average crafters. (1) - If I know I can hit IQ11 (you know this around IQ8 or 9), I swap out all my remaining Hasty to Basic T (or even Standard/Advanced T) to make sure I get the IQ11, and have just enough CP to finish the Byregot phase. (2) - If I can only hit IQ10, I'll risk with all Hasties, and save as many CP as I can to bait for a Good on the Byregot. I can usually bait at least 1 more step with my extra CP. I would continuously press Steady Hand II /Great Strides until I get a Good, and making sure I have enough steps of Ingen II left for the rest of the synthesis (if i'm using rotation #2 or #3). I leave 55 CP behind before I give up the baiting. If I don't get a Good, I Reclaim. Be discipline here. If you don't see a Good in time, Reclaim it. (3) - If I can only hit IQ9 (i.e. two steps blew up, which is quite common), then I will spend all my extra CP on Master Mend (92 CP), Waste Not, or Manipulation (only GSM has it because no cross class space for this in other classes), just so that I can hit IQ11. If CP is too much of an issue for the remaining Byregot phase, I would even skip the Steady Hand II here on that 3 extra Hasty Touches. If I can land 1 or 2 Hasties, that gives "hope". If IQ9, there's no "hope". IQ9 is simply not enough even if your Byregot lands on a lucky Good. So might as well test your luck on getting more ToTs later by extending the process and hitting IQ11. You do need enough CP for Steady Hand II, Great Strides, Ingen II & Byregot at the end to make use of the IQ10 or 11 (cost 113 CP) (in Rotation 2 & 3 above). Otherwise, just Reclaim. (4) - When I get an Excellent, I consider swapping out the Hasty with a Basic, so I get it 100% fidelity (unless I really lack CP). If the Excellent come at a very late touch, I might even consider doing a Standard Touch on it. It works very well if you are already sitting on IQ9+ and has extra CP. The extra 25% efficiency from a Standard T over Basic T is multiplied by 4x. (5) - If an Excellent appears at a time where I don't have Steady Hand active, I still touch it with either Basic or Standard Touch. It's better to risk a 70% touch or a 32-CP 80% touch there than placing a Steady Hand on an Excellent, and then suffering Poor on the next touch. If the touch fails, at least your Steady Hand will land on the Poor, and your next touch is back to normal. (6) - Do NOT touch on an Excellent if it's BEFORE your Inner Quiet. You lose an IQ stack! (7) - If you have extra durability for more touches even after reaching IQ11, keep pushing touches before your Byregot. At IQ11, even a single Hasty Touch can help to increase quality by a lot. Your IQ will not increase any further, but any more quality increase from single touches will help. Sometimes, these little choices/decisions would make a big difference on the final outcome, and here with these Monstrosity 3.9 items, this is exactly the case. And this is why manual crafting > macro, and it's a lot of fun. - A rare lucky Excellent on the Byregot helped out a lot! - I acquired all the Master Recipe Book II's without the new Artisan's Offhands. I didn't even have any Artisan's gear on me except the Artisan's Specs & Supra tools. I was wearing most just i55 gear, i70 specs and a Supra Tool. You don't have to rush like me though. If you get the Artisan's Offhands & the shared Artisan's gear first (or even Lucis Tools now in Patch 2.5), things will be a lot easier. e.g. Arachne Velveteen, Wootz Ingot, Wootz Cuirass, Arachne Robe, Arachne Bandana of Scouting, Kirimu Coat etc. Finally, we have arrived at the ultimate 4 star crafting! 4 star crafting has a very strict requirement of 451+ craftsmanship & 407+ control. You must possess (1) the Supra Tool, (2) the new Artisan's Offhand with overmelds, and (3) 1 of the 3 new Artisan's Mitt/Culottes/Sandals, or the Ehcatl Smithing Gloves, in order to hit these requirements. 4 star is tougher than 3 star for sure, but not by too much. The rotations are somewhat similar, except a harsher requirement on quality. Just like 3 star, if you start off with a significant amount of HQ mats to boost initial quality, then it's not too difficult. The really hard ones in 4 star are really the "mats" like Arachne Velveteen where you have to push quality from zero. For a 3 star Terminus Putty, if you can get IQ10 or IQ11, then it's nearly guaranteed 100% HQ. In 4 star, not quite. You basically needs IQ10 or IQ11 to even have a chance to HQ it, and then you really needs some luck on baiting a Good condition on the Byregot. Both methods are very viable, and are capable of getting the job done. I have previous wrongly posted the requirement for Method #3 as "452 craftsmanship". I sincerely apologize for this error. The advantage of #1 is that it's only 5 steps, leaving 1 extra step for quality. It has only 1 Rapid Syn that can be done early, so the risk is low. It utilizes Ingen II near the end, so it adds 1 extra step for baiting a Good for the Byregot, but this also means 32 extra CP needed near the end. The advantage of #2 is that it is highly secure (PBP has 90% success rate even without Steady Hand), and very flexible on the aspect that you can push progress any time when Steady Hand has fallen off. E.g. if you're 1 step away from reactivating Comfort Z, or if you're at 30 or 25 durability which you are 1 step from using Master Mend II, activating a new Steady Hand II will be suboptimal. In this case, using a plain PBP or CSII would be a very nice choice so that the 5 steps of Steady Hand II can be maximized after clicking Comfort Z or after using Master Mend II. The disadvantage of #2 is that it is costly on CP to use so many PBPs. If a PBP fails, it'll cost even more CP. Also it is obviously involving 6 steps, so you have 1 fewer step for quality. The advantage of #3 is that it is theoretically the most CP efficient. The whole completion process apparently only need 15 CP on 1 PBP. You don't even need Ingen II in you arsenal. However, notice that now you have to use 2x Rapid Syn under Steady Hand II, and it is more risky. And if 1 Rapid Syn fails, that's 3 steps under a Steady Hand II gone. So it does eat away 2 to 3 steps from a 25 CP Steady Hand II. Luckily, Ingen II is not required here, so an extra 32 CP is saved as well. Personally, I prefer the #3, but that's just my choice. You can do any of the above, and it should still work. 4 star mats are now sold by Auriana at Rev Toll (See pic below). As you can see from Fig 3, the Byregot without Innov at IQ10 (highlighted in bright green under blue column) is actually weaker than the Byregot with Innov at IQ9 (highlighted in pink). However, the quality gain from the extra Basic Touch (highlighted in green under red column) plus the Byregot without Innov at IQ10 would give more quality than the Byregot with Innov at IQ9 alone. But of course, if you save the 18 CP for Innov, and you succeeded in the last Hasty, you'll get the strongest Byregot. Furthermore, by including Innov before the Byregot, you added 1 more step to "bait" for a Good or Excellent condition. If you get an Excellent any time before the Byregot, feel free to skip all those Great S/Innov/Ingen II. If you get a Good after Great Strides, you may skip Innov/Ingen II & go directly to the Byregot. If making furniture, minions & glamor clothing are all you care, then you can pretty much ignore your control stats and forget about pushing quality. This is because quality does not matter for furniture & minions at all (For glamor items, even if you make it HQ, it’s really to show off how good a crafter you are. And the HQ can only be seen if you’re actually wearing that dress/skirt. If you glamor something with it, the HQ of course would not show up.). The only thing that matters is that you complete the synthesis. So, as you may expect, crafting low level items of such are easy as cake. As for higher level items, you would expect Piece By Piece, Waste Not, Ingen II & Careful Syn II to play major roles. Please be careful that the hardest furniture actually has higher difficulty than 3 star gear/weapons. So it takes more PBPs to craft them. But it’s really THAT simple. Just make sure you use enough PBP under WN & Steady Hand, and you’ll be in great shape. You'll notice that many of these top furniture, minion or glamor clothing require some very precious mats that can worth up to a million gil or more. Thus, make sure you have the above cross class skills before trying any of them. Also, be careful when you craft any furniture that has Elemental Aspects like the Tidal Wavesoul Fount or Ice Chandelier! Your progress from Careful Syn II will be reduced by half! You don't necessarily need to load up the Water Brand or Ice Brand, but you must use enough Waste Not/Piece by Piece under Steady Hand before switching to Careful Syn II under Ingen II. Having Rapid Syn ready in the arsenal as a back-up is also a good idea. Special thanks to my genius crafting sensei Nabeshin Nabeeeeshinn for his support and pointers throughout my crafting career. Thanks to my wonderful crafting colleagues Picka Peppa & Pieris Angelika for helpful discussions. Also, thanks to my dear friends Nubonaga Oda (Evil Nero), Raven Karasu, Zero Maverick, Mina Arinelle, Kirito Leatherby, Dsparil Heretic, Tsumiki Miniwa, Jackie Wolf & Zueex Destino for helpful resources. 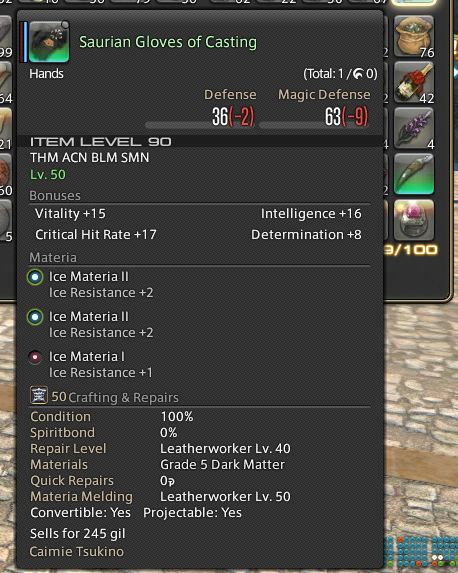 Special thanks to the "Mushy-Tailed" Retainer Fox for gathering mats for me for my acquisition of Lucis crafting tools. Last but not the least, thanks to my gaming partner, Valestia Tsukino, for her constant support on all sorts of things in the game. Lliana Hylrin, Sovereign Grace and Fybrile like this.